This 6 day retreat includes meditation, pranayama, fascial release, plus yoga asana and philosophy to transform body and mind…. and an introduction to Horse Wisdom with Krista Brown and the resident herd. 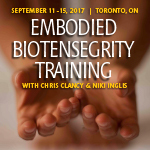 Embodied Biotensegrity Training: Movement and Presence through the paradigm of wholeness. This day long retreat includes meditation, pranayama, fascial release, plus yoga asana and philosophy to transform body and mind…. and an introduction to Horse Wisdom with Krista Brown and the resident herd.